On the last day of school Ana came home with a bottle of bubbles. 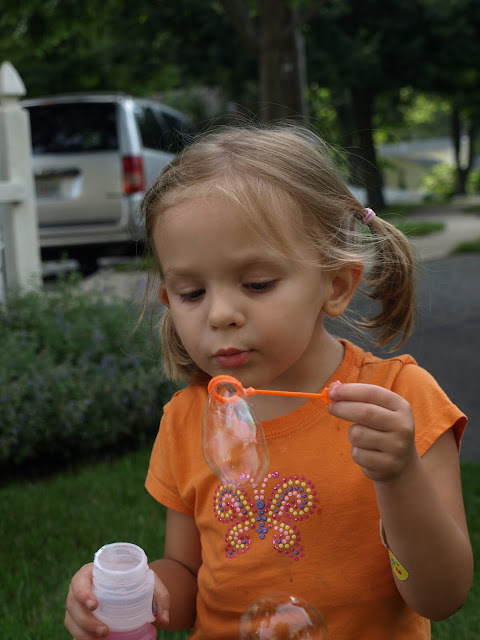 Ever since then she's been wanting to "blow bubbles blow bubbles blow bubbles". But, she has a rotten mother who doesn't like to blow bubbles and who thinks of a million things to do in order to redirect the activities away from the bottle of bubbles. Anyway... he likes bubbles, he couldn't say no to Ana, he wanted to sit in the lush NJ grass... I don't know. Whatever the case, there were bubbles being blown. Well, almost being blown. Ana, can you blow bubbles? I did it! I blew bubbles! It took forever... but I got a bubble... and I'm the happiest kid on earth!!! And then Grace came over and was like "here, gimme that thing." I suppose that just goes to show you what a 6 month difference can make.